Ric's Food Center is proud of its award-winning meat department where we carry Star Ranch Premium Angus USDA choice grade beef, Hormel Natural Choice fresh pork, and Gerber All Natural Amish chicken. 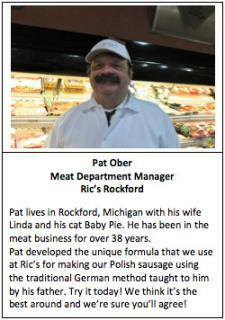 From cooking suggestions to special cuts of meat, our meat experts at Ric’s are always ready to help. One of the most popular features is our signature certified ground beef program. This means that we grind our beef fresh throughout the day, and guarantee the leanness of each ground beef product. Our ground chuck is always 85% lean, our ground round is always 90% lean, and Ric’s ground sirloin is always 95% lean with a 5% fat content. In our meat department, it’s easy to make informed choices for your table. We have the leanest ground beef in town, and it still packs in the flavor! When it comes to quality meat and seafood, it doesn’t get any better than what you’ll discover at Ric’s Food Center. With over 30 years of experience, department manager pride themselves on supplying the Rockford area with the finest and freshest products available - with the highest level of service.